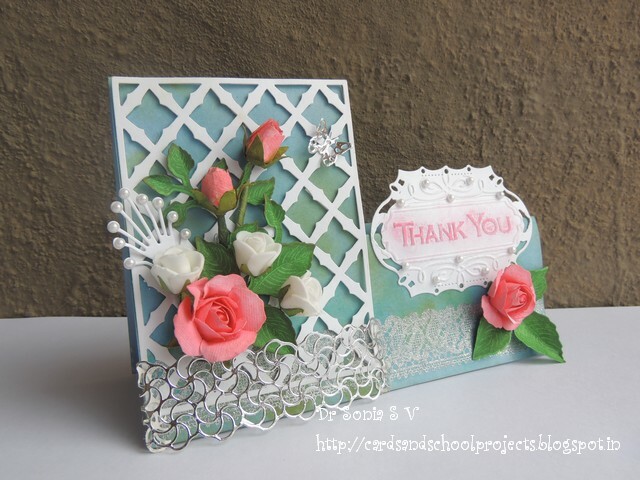 Hi friends Thank you so much for all the appreciation you showered on my Sospeso Transparente Bouquet tutorial ..I was thrilled to know I had introduced a new craft to many of my readers! 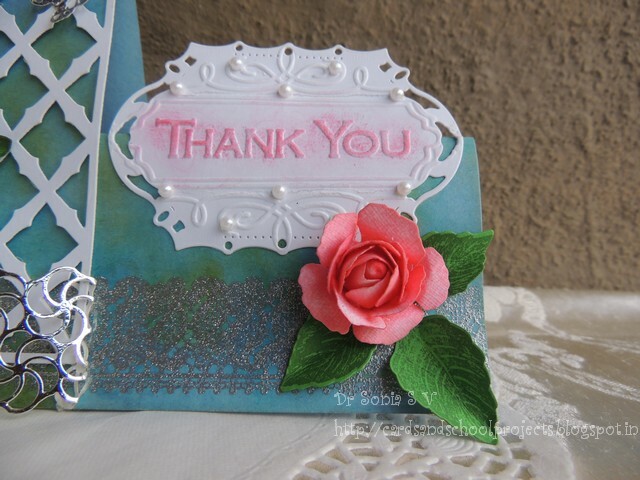 Sharing a simple side step card with an embossed "Thank you" and handmade paper roses. 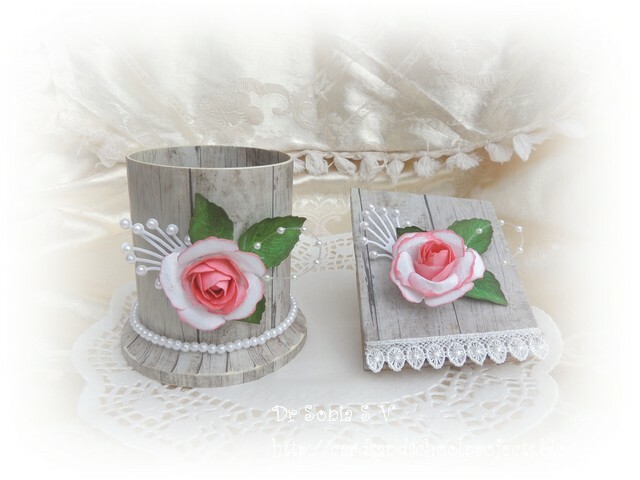 Many of you liked the roses in the Decoupaged Stationary set and wanted me to share a tutorial so made another project with the same type of roses though they didn't turn out quite as beautiful even though both were made using the same technique -----well that's handmade isn't it...wows sometimes and is "so so" at other times! 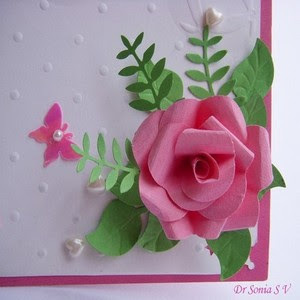 Roses are one of the most difficult paper flowers to make and I have shared a couple of tutorials earlier on how to make roses with Punches [see thumbnails at end of this post]. 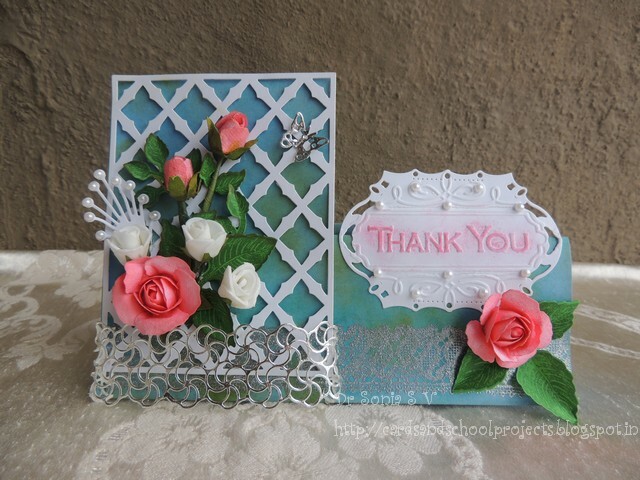 The peach pink roses and buds in this card and all the roses in the projects below were made with the Spellbinders Rose creations die. 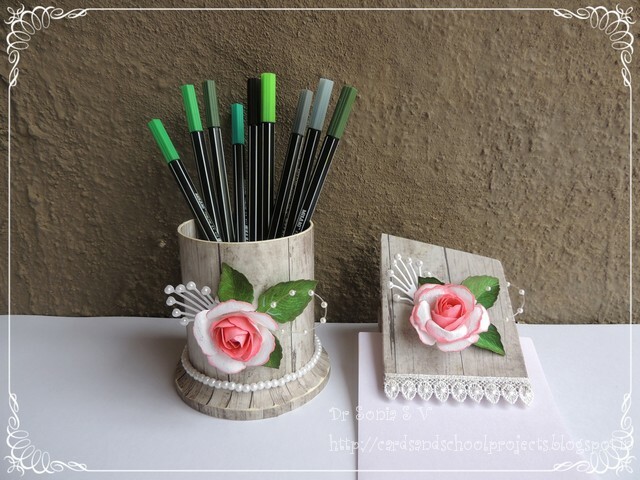 Decoupaged Pen Stand - check out the link for tips on how to decoupage on plastic. 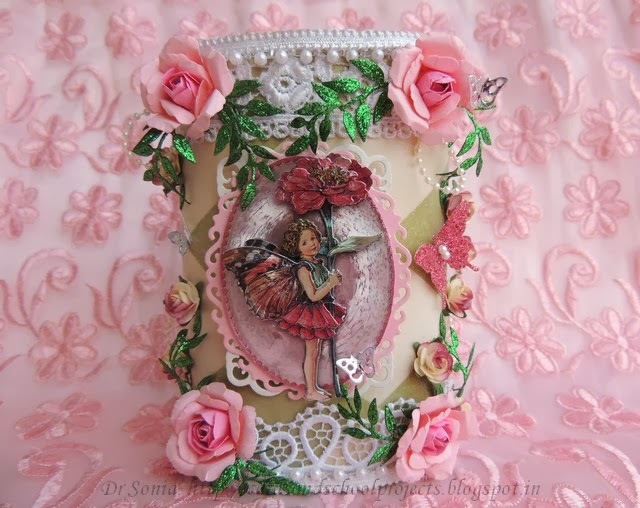 Handmade Photoframe - a DIY photoframe made by recycling a desktop calendar and adding lots of paper roses! 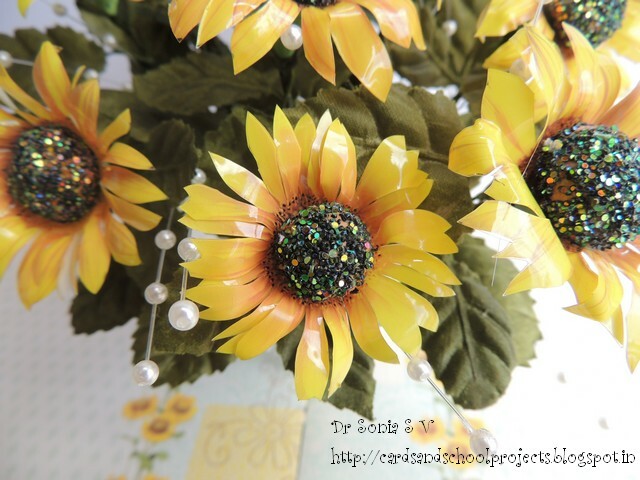 "Hot glue" Embellishment tutorial - this post also has a tutorial on how to make your own "Faux Porcelain" embellishments at home using hot glue! 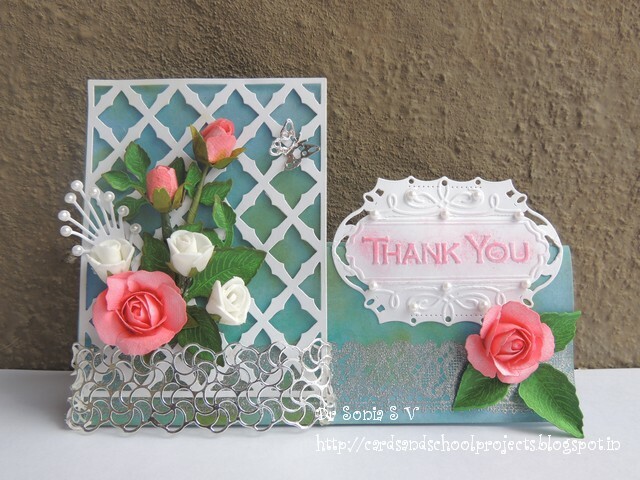 Gabriella Pollaco has a beautiful tutorial on how to make roses with the Spellbinders die....but I have struggled in making the conical center as well as shaping the petals of the paper rose as my hands are not as nimble as hers!! Sharing a method I sort of invented and started using recently which makes "rose making" so much easier! 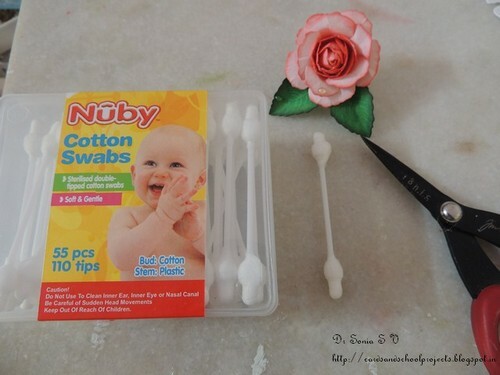 Ear buds [Q tips] -- yes you read that right!! In fact I got the idea for this rose after seeing these funny looking ear buds in a local supermarket as it looked just like a rosebud! If you don't get these you can fluff up a regular ear bud and try but if you see these funny shaped ones in your chemist shop or local supermarket...grab them with both hands!! 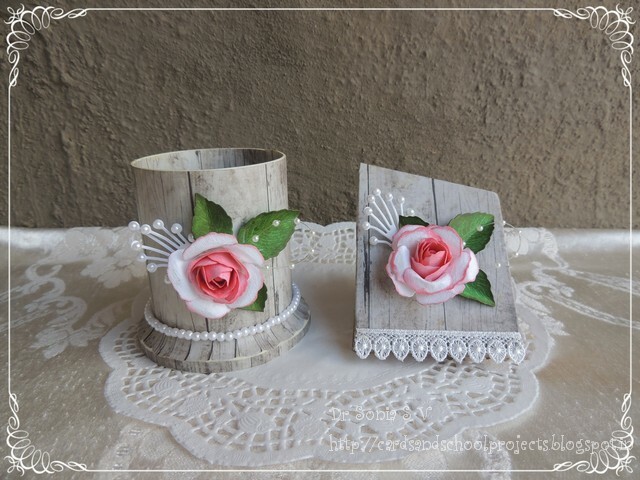 Paper flowers- though I have used the Spellbinders rose creations die, you can use any die cut, punched or hand cut flower [here is a hand-cut flower tutorial] which can wrap your ear bud within it! 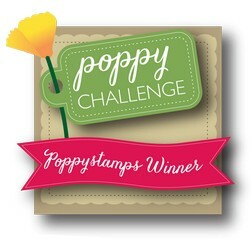 I used the 2nd and 3rd largest flowers from the die set as marked by the blue arrows. 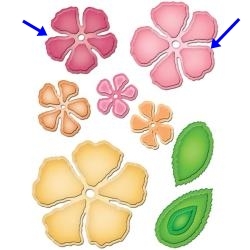 Ink pads- optional- if you want to make 2 tones flowers or ink the edges of your flowers like I did here.You can paint your flowers too but using ink pads is easier and faster. Glue - I strongly recommend using a hot glue gun unless you have tons of patience ! 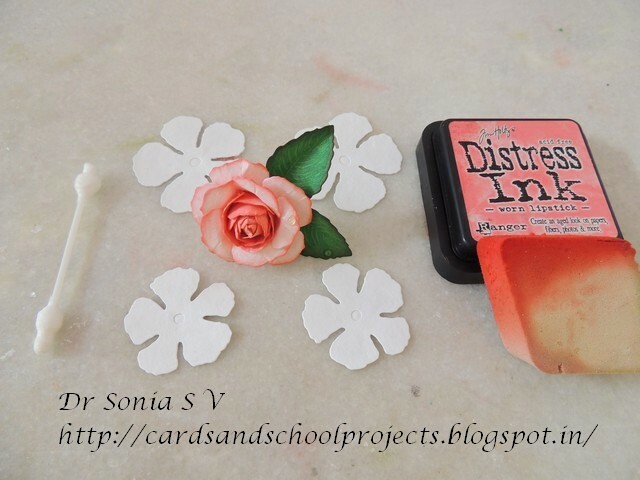 I captured photos of all the steps in making the paper rose and since there were quite a few photos have made a video slideshow of the Paper rose tutorial - Its less than 2 mins so do have a look at it to see all the steps in detail but here are the key points. To make a Rosebud you just need a single flower and a ear- bud! -- Yes its that easy! Inking : This step is completely optional- you can skip it and dive into the rose making! Why this rose making tutorial so easy is you are using the ear-bud to make the center of your rosebud or rose ! Wrap the petals of your flower around the ear bud and glue as you go! Because the ear bud has a stick, holding the flower while hot gluing it is easy and less likely to give you burns from the hot glue! 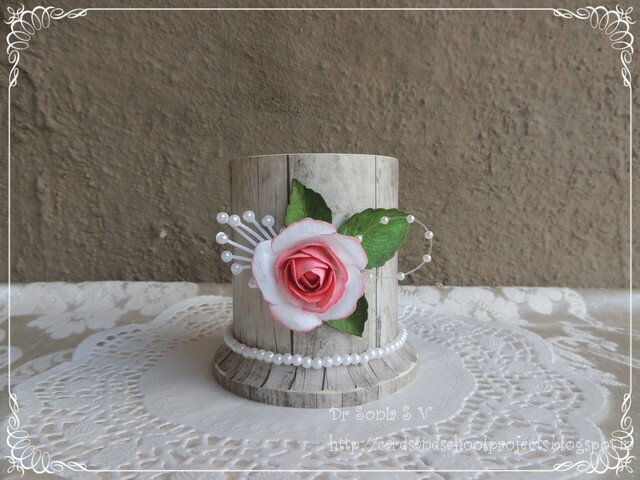 You can add a calyx to your rose bud and wrap floral tape or green paper around the ear bud stem to make a floral bouquet for your cards or scrapbooks. If you want a fuller rosebud ..make it with 2 small flowers. 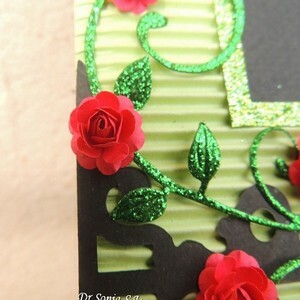 If you want to make the rose.....insert the 2 flower- bud into the larger flower and glue the petals around it! 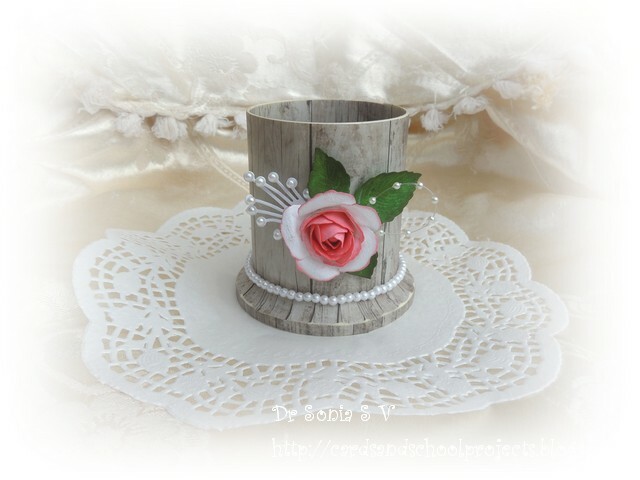 You can add more flowers to your rose to make a fuller rose! 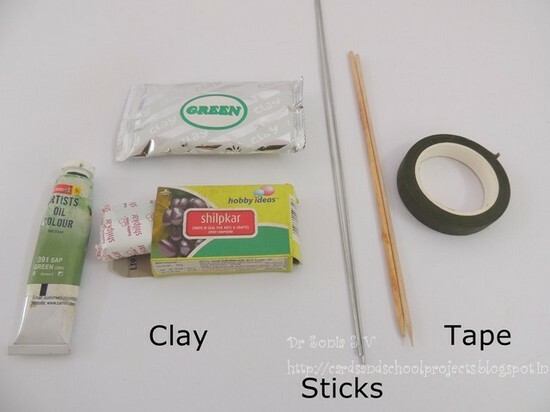 Other options to use instead of ear buds : bead, cotton ball, Styrofoam/thermocol ball, scrunched up paper ball or clay ball in the center. 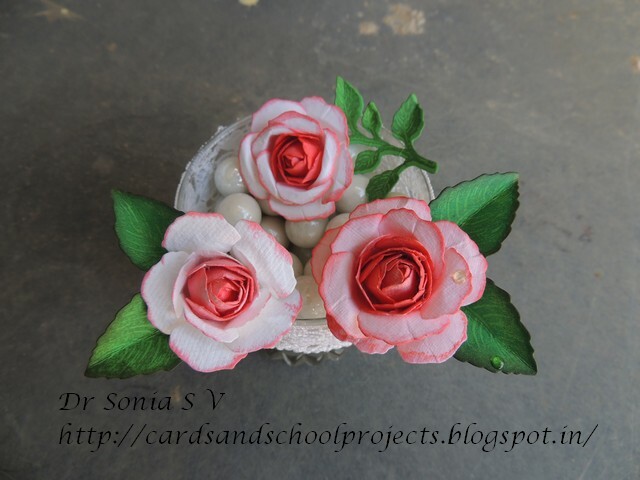 I hope you enjoyed my easy rose making tutorial .Do tell me how it is. 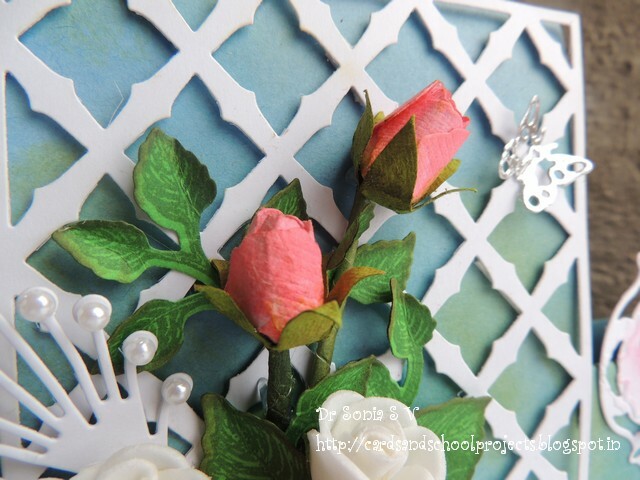 Here are links to more tutorials to make your own Paper Roses using Punches. 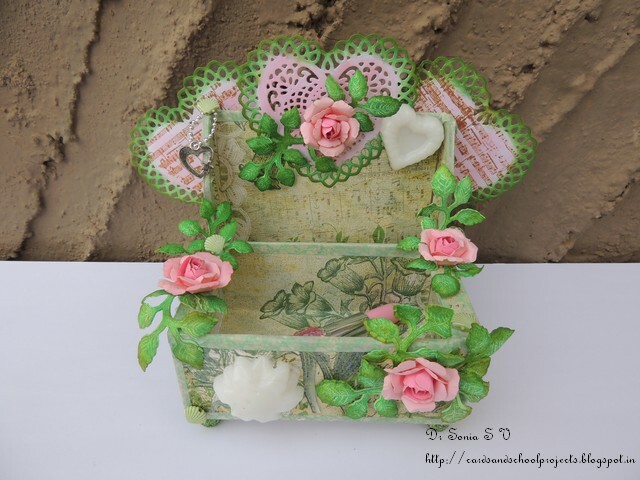 Hi friends many of you may be already familiar with the beautiful craft of Sospeso Transparente but if you are hearing about it for the first time...Sospeso Transparente is a 3D Volume Decoupage craft invented and patented by Italian artist Monica Allegro .It basically involves heating and shaping flat designs into gorgeous 3 dimensional beauties! 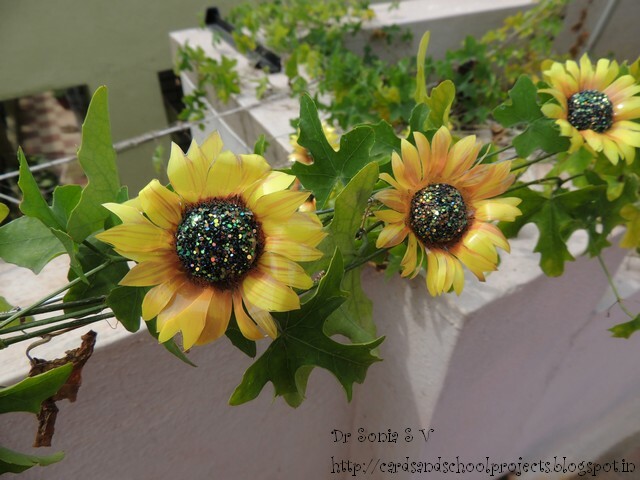 These Sunflowers are my first attempt at Sospeso Transparente and I had so much fun arranging the them in all sorts of places in my house- the picture above is of our Passion fruit Vine adorned with Sospeso Transparente Sunflowers! 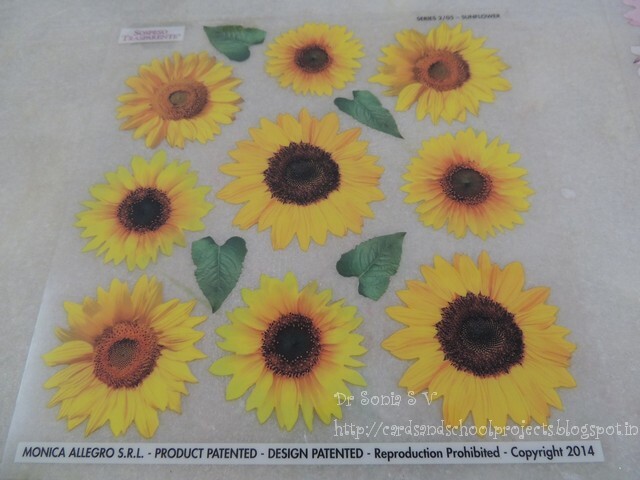 Sospeso Transparente is one of the most magical crafts I have come across...it is indeed sheer magic to be able to convert a printed film of Sospeso Transparente into a magnificent 3 dimensional object! 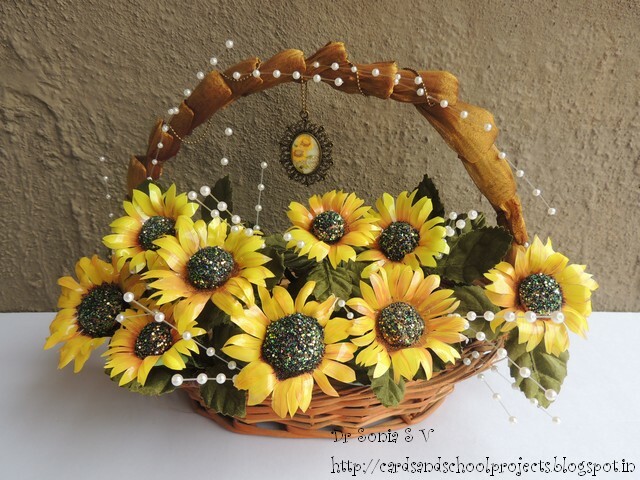 Sharing a mini tutorial on how to make the domed center of the sunflower. 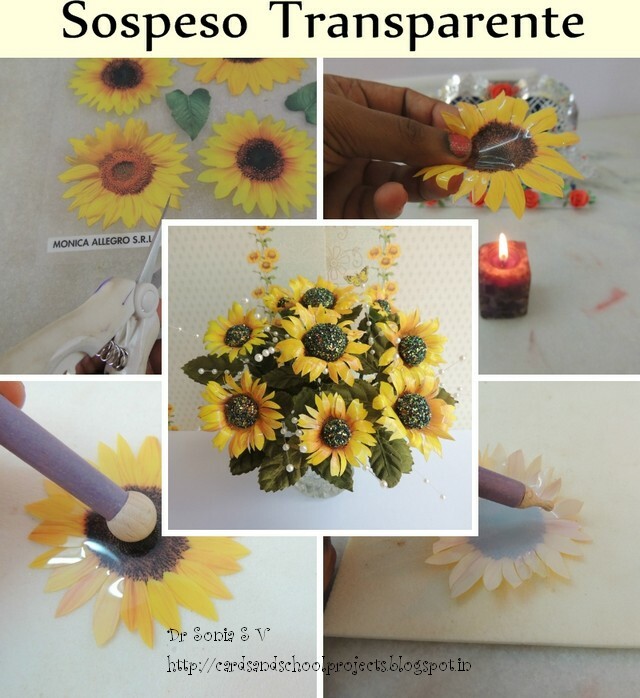 You can use the technique not only on Sospeso Transparente flowers but also on felt, foam and paper flowers. 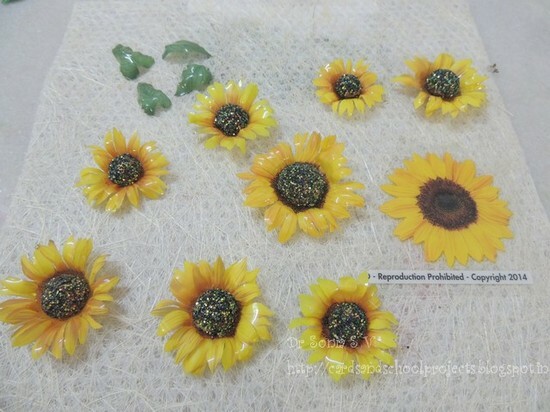 Coat domes with glue :Put your clay dome on a plastic sheet/ lid etc[ so that your flower center wont stick to it!] and generously pour or paint the dome with glue. 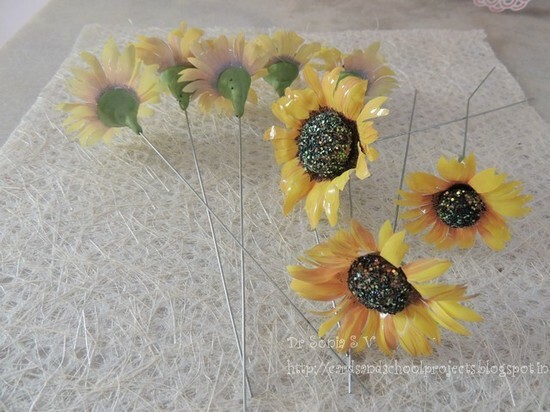 Pour glitter onto your clay dome: Get a good covering and shake off the excess after giving enough time to dry-- DONT BE Impatient and touch your flower center before its fully dry or you'll end up with sticky glitter all over your fingers! 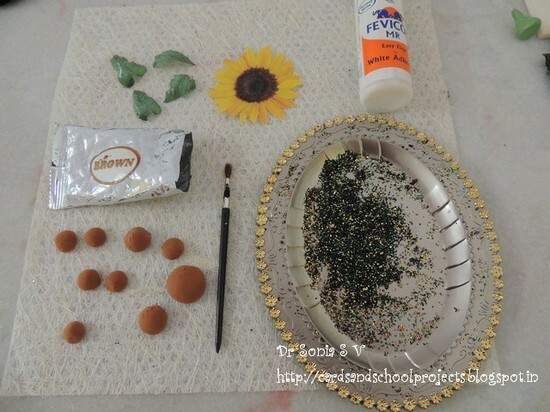 Again this mini tutorial is not just for Sospeso Trasparente flowers but can be adapted to make a bouquet of felt, foam or paper flowers. 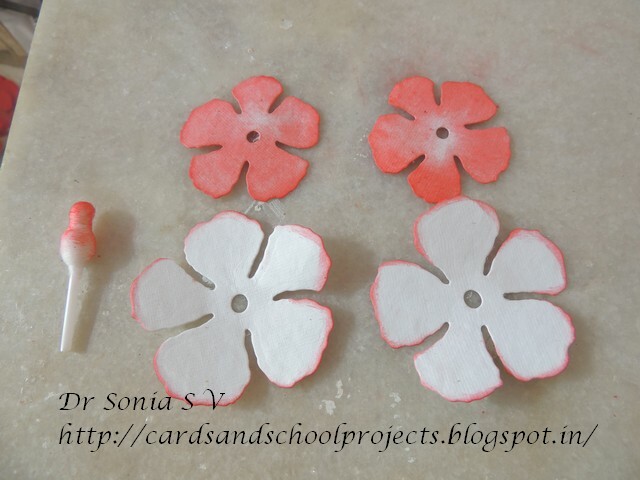 Clay -to make flower calyxes- you can use the soft types of children's clay in the market [like Amos, Super clay etc]which dries lightweight without cracking or more expensive air drying clay or if you are from India Mseal like I have used here. If you are using Mseal : Mix in a little green oil color into your mseal dough while you are mixing it [ like I did for my Altered Bottle art] .Also another important point while working with mseal is you have to work fast to take advantage of the sticky nature of the mseal. 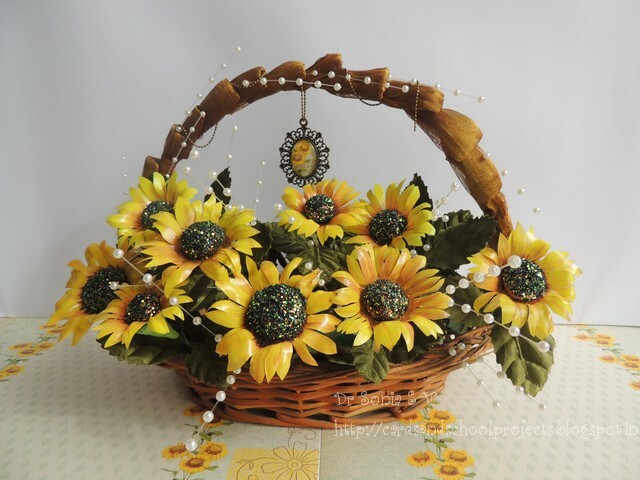 Slightly flatten the top of your "clay calyx"
Here is the link to another Handmade bouquet tutorial variation with the flower calyx made by quilling . 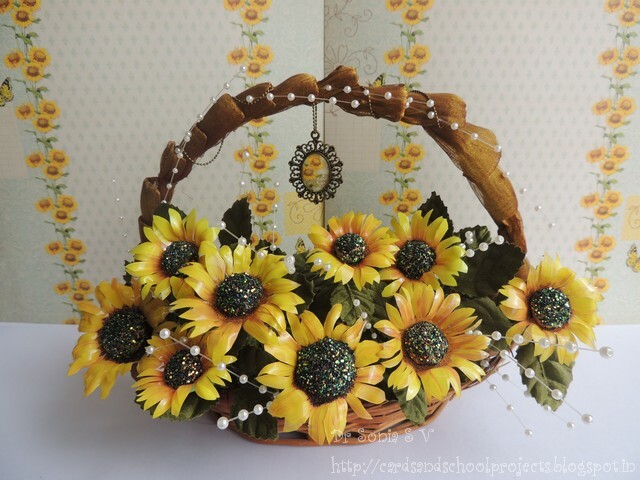 I hope you liked my little "Bouquet of Sunshine" to warm your day this season! Do tell me how it is. Hi friends Thank you so much for the supportive comments about my blog tutorial post being copied.....it was such a depressing incident but I think I have to jump right back into sharing and not let a handful of unsavory people affect me as there are so many wonderful people who drop in on my blog ,who take time to write encouraging comments and who mail me thanking me for the crafty tutorials. 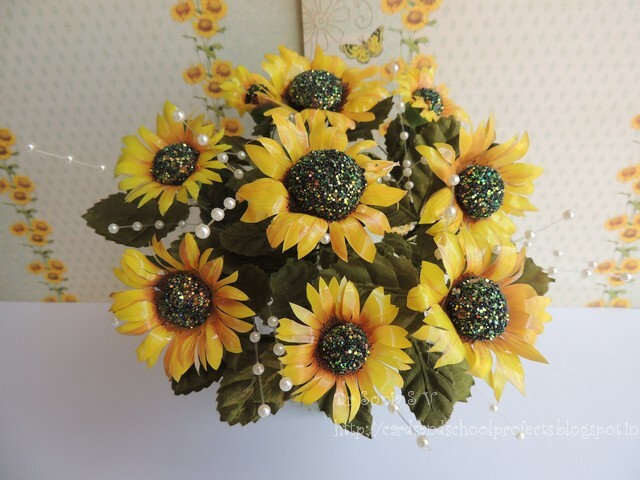 My regular readers know that I love to make my own flowers and believe me roses are the toughest handmade flowers to make! 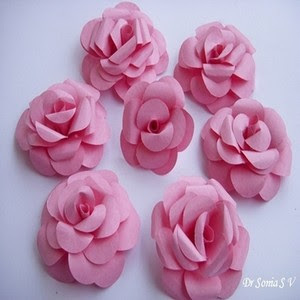 Recently I experimented at simplifying rose flower making and could make these paper roses! 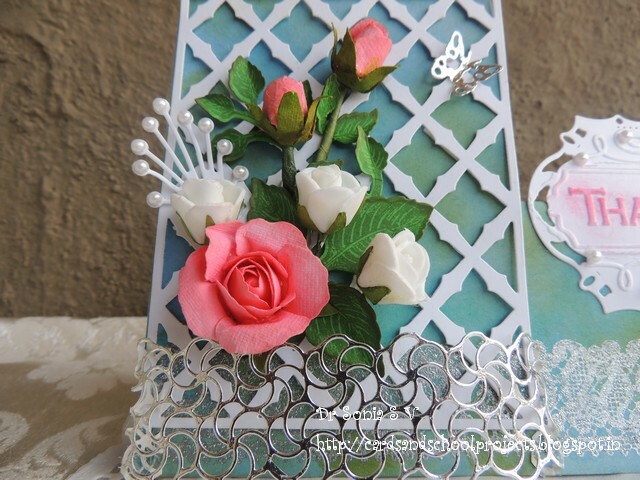 Here is the link to making your own handmade roses: Easy Paper Rose tutorial ! 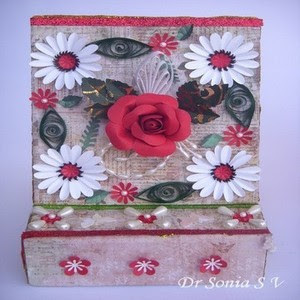 And sharing a few tips on how to decoupage plastic material. 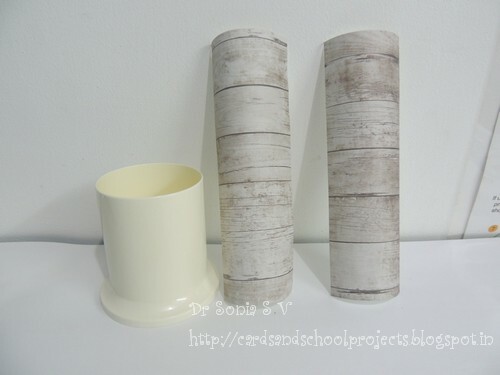 This was the plastic pen-stand I altered by decoupaging. 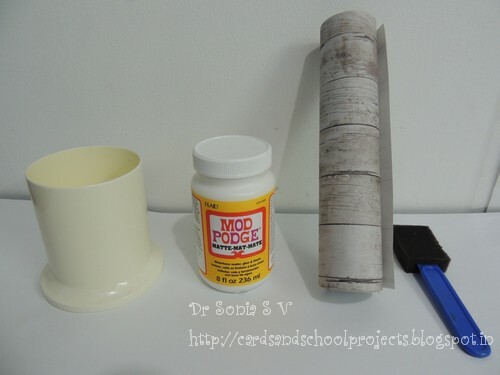 Decoupage glue : Mod Podge Matte - I prefer Mod podge to watered down Fevicol[PVA glue] as it has the perfect consistency and stickiness property! 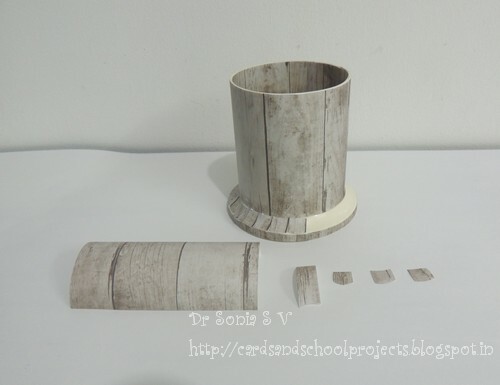 If you are a beginner at decoupaging the best starter project is a wooden object and MDF is the ideal material to Mod Podge! 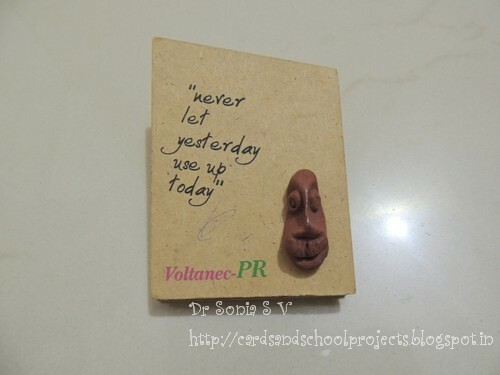 Attempt plastic only after you have got a hang of decoupaging techniques.The reason why plastic is difficult to decoupage is because its surface is non porous and your paper can keep sliding off! Sandpaper it : To help decoupage an extremely smooth plastic surface you can actually sand it with sandpaper to roughen it up a bit.I didn't have to do it in this project as my pen-stand was not too smooth . Be very very patient - give enough time for your paper to stick to the base-coat of Mod podge before applying your top coat or your paper will just lift up and make you frustrated! 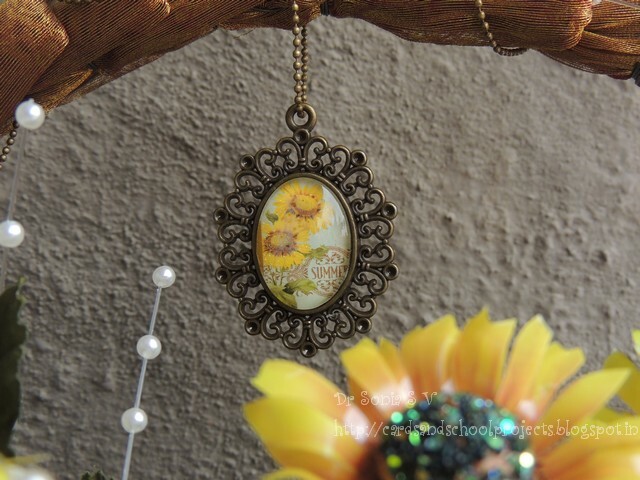 A little bit of my plastic does show through but I think it adds to the charm of the final decoupaged object in this case! 10 Blogger Tricks to a Better Blog!